From a witch's black cat to a ranger's mighty wolf companion or a cavalier's noble steed, animals have always had a place in fantasy adventuring - but why should only a few classes have all the fun? With the proper training animals can be invaluable allies for adventurers of all stripes. Whether you're a scholarly spellcaster looking for a familiar to deliver spells or help turn the pages of your spellbook, or a brawler ready to lead your armoured animal into the thick of battle, this book is a treasure trove of rules and advice aimed at helping you and your animal friends get the most out of your fantastic adventures. A complete list of every familiar in the Pathfinder Roleplaying Game, to make choosing yours quick and convenient. New archetypes like the mad dog barbarian or carnivalist rogue to help classes that haven't traditionally used animals work with their bestial allies, as well as tips on how every class can employ animals. New animal companions and familiars, from innocuous squirrels and rabbits to bizarre platypuses, armoured armadillos, and powerful pandas. 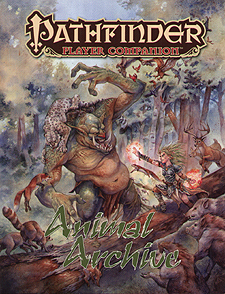 Information on which animals are closely associated with the various races and deities of the Pathfinder campaign setting. Tons of new tricks and feats to customize your animals, plus archetypes for animal companions and familiars. New animal equipment, spells, magic items, information about the personalities of magically intelligent animals, and more.